My oldest daughter used to love Tzatziki sauce – you know, the Greek one – with cucumbers and yogurt and Dill? So it fell off my radar when we became plant based in 2013, but the other day I was thinking, why have I not created a vegan version of this for her yet??? So a couple days ago, I did, and here is the recipe, it’s extra awesome because I figured out how to make it without having to drain the cucumber juice – so it’s faster and easier than usual recipes. However, I was running out of time, so just as I was about to make it with herbs from scratch, I realized I had the Epicure Lemon Dilly Dip Mix and that it would work great. So this version uses that spice mix. Instead of the Lemon Dilly Dip Mix use fresh or dried dill, a bit of mint if you have it, some onion powder, garlic powder, and a teaspoon or two of lemon juice. I plan to post a non-Epicure spices version as soon as I make it again! If you live in Canada then you can buy it from me here and ship it to yourself. The reason I am posting this recipe is because using tofu turned out a very tasty and refreshing vegan Greek Tzatziki, with great consistency. Apple cider vinegar is the right acid to use, in my opinion, because it is slightly sweet, and gives a yogurt flavour. Use medium tofu to make a low-fat, dairy-free, yogurt substitute and in the food processor it is ready in just a few minutes. I hope you find a way to make it too! Here is a lovely picture of Greece for us to consider as we enjoy our Tzatziki! I’ve never been, but I would love to go!!! I wonder how the vegan options are there. The key takeaway I hope you enjoy from this recipe is: you can use tofu and apple cider vinegar as a yogurt substitute! Plus, this recipe is easier than most traditional Tzatziki recipes because there is no need to drain the cucumber liquid. The reason? It uses thick Medium Firm Tofu, as a yogurt replacement. The cucumber liquid is required to make it the perfect consistency. Rather than fussing with cucumber in a colander or strainer, you can make this in 2 easy steps in a food processor. Less mess, fast, easy, chunky, fresh, and dillicious in 5 minutes. I made this with the Lemon Dilly Dip Mix from Epicure, I've included untested instructions if you don't have the mix, and hope to test and update that version here soon. Add tofu to food processor with Epicure Lemon Dilly Dip Mix (or individual herbs), salt, pepper, apple cider vinegar. Blend on high until creamy. Add cucumber chunks and process on high or low until just diced, some larger chunks should still remain, do not over process or the dip will be too runny. Serve! The flavours will blend almost immediately. Vegan Tzatziki is a protein rich low-fat fast refreshing snack for adults and kids. Try serving Tzatziki dip with raw vegetables, such as carrots, cherry tomatoes, snap peas, and red and orange peppers. Spread on whole grain toast cut into triangles, or baked no-fat pita chips for dipping, for a light healthy meal, snack, or lunch idea for school or work. Colorful sweet potatoes, maple flavoured chipotle chickpeas, earthy mushrooms, vibrant greens, creamy avocado and a fiery vegan mayo makes for a spicy and healthful vegan meal. Use tofu cubes instead of chickpeas, for an equally spicy protein option. Start by putting peeled sweet potatoes on to boil. I recommend you cut them in half, to speed cooking time – I didn’t, and they were a little undercooked. Second, prepare your mushrooms – dried or fresh. You can use dried mushrooms, or fresh. I like to have dried mushrooms in my pantry, they don’t spoil, and I always have some on hand. Dried mushrooms are so amazingly excellent for flavoring soups. They tasted great rehydrated in this recipe as well, a bit chewier than fresh though. 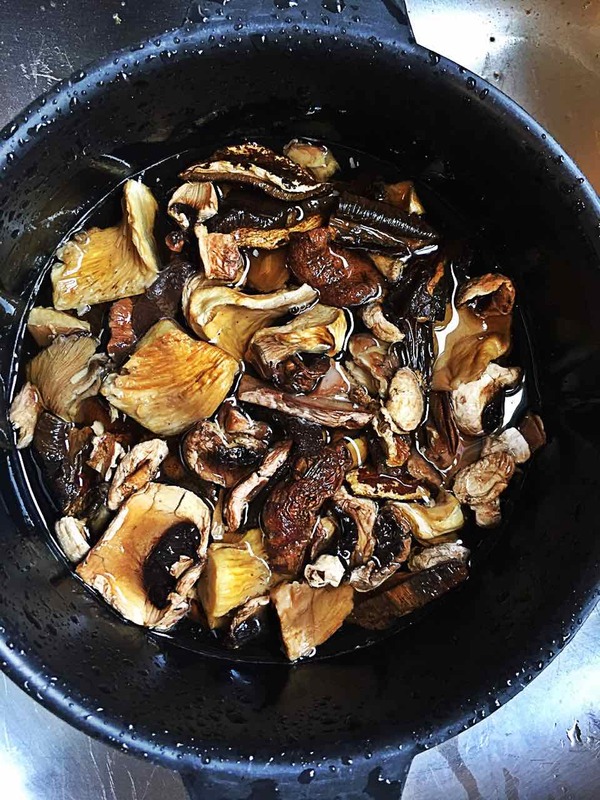 The broth you get from rehydrating mushrooms is so flavorful, save it if you can! I bought this huge container of gourmet dried mushrooms from Costco, and followed the instructions for rehydrating, first in hot water, then boiling. I used the microwave, thinking it would be faster and easier. If you use a microwave too, be careful the water doesn’t boil over. Next time, I think I will use a pot on the stove instead, so I can boil the mushrooms longer and make them less chewy. See the recipe notes for instructions. Saute them, with some diced white onions if you have any, in a large skillet. Remove to a separate dish and use the same skillet for the chickpeas and/or tofu. Third, make the chickpeas and tofu. Either / both taste excellent in this recipe, separately or together. Chop some green onions, add to a large skillet with soy sauce and fresh ground black pepper and add the drained chickpeas or tofu. Add in the spices, and mushroom broth. This is where you might use tofu instead. Here, I am making chickpeas for my husband and I, and plain tofu for the kids – because one of my daughters doesn’t like chickpeas (we think she is crazy for this, but love her anyways). These spices are going to fire it up whether you use chickpeas, tofu, or both. While my chickpeas saute, I heated up the kids tofu for 3 – 4 minutes in the pot of boiling water for the sweet potatoes. I could also have done this in the mushroom water, didn’t think of that until later, that would be even better, yum! First, reserve about 5 cubes of cold tofu for the Fiery Vegan Mayo Sauce, throw them in a small blender instead of the boiling water. Prepare the fiery vegan mayo sauce. With tofu, cashews, a touch of lemon juice, chipotle powder or hot sauce, smoked paprika, soy sauce and some non-dairy unsweetened milk. I use soy milk, cause it’s my fave. Lastly put the bowls together! First set down a bed of energy boosting greens, like baby spinach. I used romaine lettuce for my girls. Then, create rows of the vibrant orange sweet potatoes, spicy maple chickpeas and/or tofu, dark flavourful mushrooms, bright green sliced avocados and drizzle generously with the fiery creamy sauce. It’s a fat free sauce after all, and so spicy good, use a generous amount! Each color in the bowl, provides different antioxidants that you need. With a vegan bowl recipe like this, eating a rainbow of foods is easy and you are going to feel great after this medly of nutritious foods. A spicy, sweet, beautiful bowl of taste, and health! 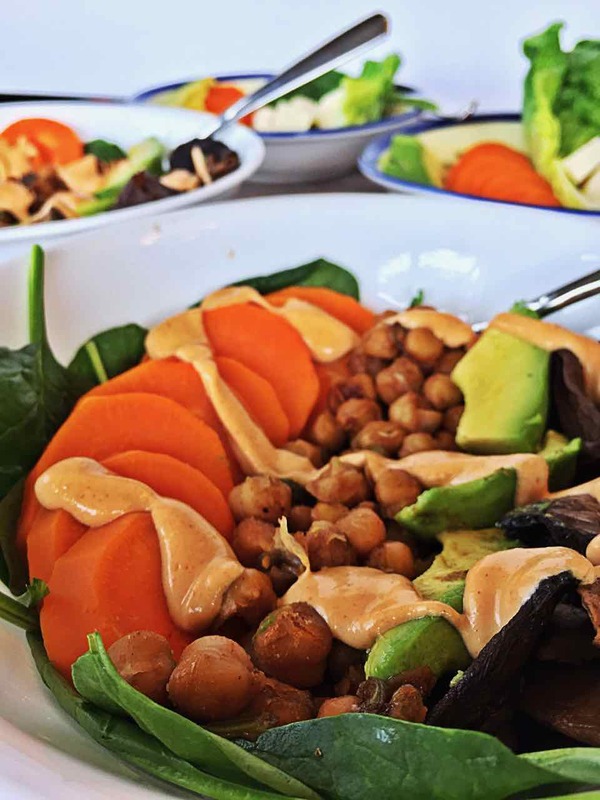 Spicy and sweet, a satisfying bowl with chickpeas or tofu, avocado, sweet potato and mushrooms on a bed of greens. Serve with Fiery Vegan Mayo sauce. Put a pot of water on to boil. Peel the sweet potatoes and cut in half (to speed cooking time). Add to the boiling water. They should take about 10 - 15 minutes to cook. Test with a fork and when soft, remove them to a cutting board, slice into rounds just before adding to bowls. 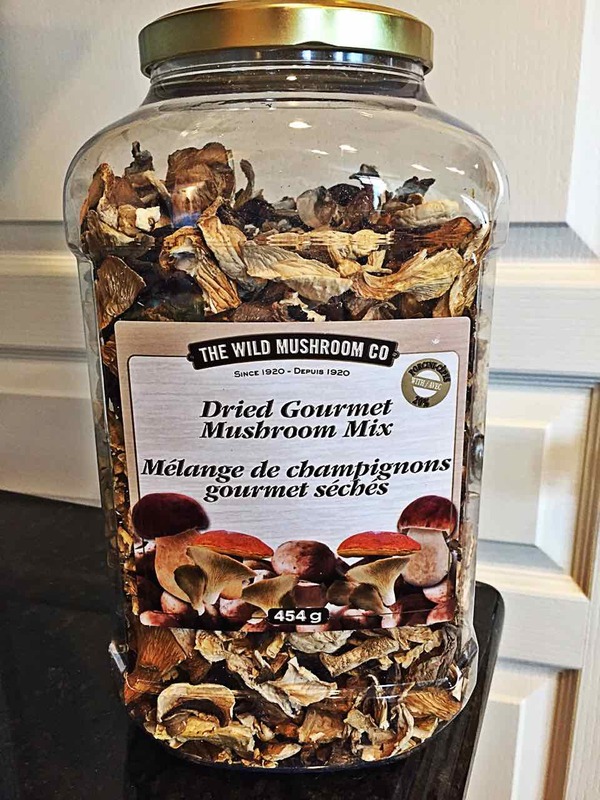 Follow instructions for re-hydrating the dried mushrooms. I use the microwave. Add mushrooms to the bowls when you plate them. No need to saute dried mushrooms, they are flavourful on their own. Use the broth to cook the tofu / chickpeas. Reserve extra delicious broth for future cooking. While the sweet potatoes cook, drain the chickpeas / cube the tofu. Reserve some tofu cubes for the sauce. Add green onions, soy sauce, and fresh pepper to a large skillet on medium heat. Add chickpeas / tofu, paprika, chipotle powder, and cumin, and stir to combine. Saute for 2 - 3 minutes, stir and flip. Add 1/4 cup mushroom broth to keep from sticking and add flavour. Add maple syrup. Stir and flip tofu cubes until the liquid is gone. Turn off heat. Build the Bowls and Serve! Place a bed of spinach in each bowl, make rows of sweet potato, sliced avocado, chickpeas / tofu and mushrooms and generously drizzle with Fiery Vegan Mayo sauce. To use fresh mushrooms, slice and saute with 1 - 2 tsp of soy sauce or tamari, and some black pepper, then remove to a separate dish. You may want to add a diced white onion - if you do: saute until the onion caramelizes and the mushrooms are tender and edges start to brown. Once the mushrooms are done, use the same skillet to cook the tofu / chickpeas. A fiery smoky sauce that looks and tastes awesome on vegan bowls! A great sauce like this, changes boring to delicious. Use tamari instead of soy sauce to make it gluten free. Add tofu, soy milk, lemon juice, cashews, soy sauce or tamari, chipotle powder or hot sauce, smoked paprika, and onion powder to a small high speed blender. Blend until smooth. Drizzle generously over bowls before serving. Fantastic Whole Foods Chocolate Vegan Brownie – Sugar-free, Oil-free, moist, chewy, healthy, chocolatey, and delicious. If you have eaten vegan low-fat desserts before, you have heard of beans in brownies. If you haven’t heard of this, welcome to the vegan revolution my friend because beans make brownies fantastic, and if you poke around my website a bit more, you will see that beans make us live longer too. Beans, beans, good for your heart… the more you eat the more you… live forever! So this is really a double bean brownie – powdered cocoa beans plus a can of white kidney beans (cannellini beans) which thank you Vegan8 for suggesting! are really better than the black beans I have used in the past. White beans blend to a smooth consistency, with no black skin bits exposing your healthy chef secret. This is a great brownie recipe because it is so fast to make, tastes amazing and has a great moist soft texture. The smell of these cooking is amazing, let alone the pleasure of biting into their rich fibre filled (instead of fat filled) soft fudgyness. There is a lot of chocolate in these, yum. Dates as sweetener is going to prevent you from having a sugar high and crash – studies show that dates help us keep our blood sugar at consistent levels. Even though there is no sugar, these are still very sweet (perfectly so, actually, cancelling the bitterness of the chocolate). So pony up kiddies, for some snacks that give you the super charge you need, to play and play, without any negative side effects. To make these perfect little bars I used the Epicure Perfect Petites silicone baking trays. Each tray makes 30 two inch by one inch bars that cook perfectly and pop out of their molds easily. No greasing required. This recipe made 50 bars. The chocolate chips add decadence – something we are looking for in a once in a while treat, wouldn’t you agree? Cocoa powder is full of antioxidants. I really think we should all try to eat chocolate powder of some form daily, as I believe the iron and antioxidants are great for us. Check it out! Please, help grow this group, JOIN, recommend it to vegan friends, HELP CREATE a vegan safe place to chat, joke, and share. With no annoying pictures of non-vegan food, surrounded by vegan LOVE. Bake 25 minutes for a more fudgy/wet brownie and closer to 30 for a more dry/firm brownie. Fills a 9" x 12" glass baking dish. Adjust the number of servings and the ingredient amounts will re-calculate. 19 oz cannellini beans can white kidney beans, drained but not rinsed. Preheat oven to 350 degrees. For 50 bars you will need a 9x12 glass rectangle dish, or 1 Epicure silicone perfect petites tray and 1 8x8 square dish, or two Epicure perfect petite trays. Grind oats into oat flour. Blend dates, covered with hot tap water, add the rest of the water to the food processor. Before blending, squeeze dried dates to make sure there are no hidden pits - to save your food processor from damage. 7 oz of dates (the default for this recipe) is about 32 individual dates or 200g. Add the ingredients except the chocolate chips to a food processor and blend for a minute. Scrape down the sides and process for another 1-2 minutes until very smooth. Add 2/3 of the chocolate chips (save some for sprinkling on top), pulse a few times to blend in. The more you process the less they will be chips and the more they will be tiny pieces. Spread the batter into the pans, making sure to scrape out as much batter as you can, don't leave any of that goodness behind! Spread the top of the batter flat and out to the corners of your pan. Sprinkle remaining chocolate chips over the top to make your snack look and taste extra special. Bake for 25-30 minutes until slightly puffed up, and the top is firm. Make your own oat flour by processing quick cooking oats in a high speed blender or food processor into a fine flour. It's really easy to do this. Measure the oats after blending. I used about a 1 1/4 cup of loose oats to get a heaping cup of finely ground oats (oat flour). It tastes nice and fresh. Once you make this, leave me feedback on here and let us all know what you think! Have you made any substitutions that worked well? I would love to put some walnuts in this. Or you can tag me on Instagram @veganenvy and with hashtag #veganenvy. Food processor, no-rise, fat-free pizza dough recipe that is great for kids. Sugar-free too. This homemade vegan pizza recipe from whole wheat flour, might sound like a tasteless hippie food, but it is NOT. Make this pizza dough and wow everyone because it tastes so much better than a preservative filled store-bought pizza crust. homemade vegan parmesan cheese (almonds or almond flour), baked right in the crust. The crust stays moist and chewy, but crispy on the edges and bottom, this healthy, vegan pizza crust, tastes really, really, good. It is sweet and salty and complements the toppings perfectly. RISING IS NOT NECESSARY WITH THIS VEGAN PIZZA RECIPE. Just needed to repeat that. Be serious about your health – feel good, fight cancer, prevent heart disease, and stay slim, by taking charge of your pizza. One of the most unhealthy and common meals. Feel and look great tomorrow, eat plant-based low-fat high-fibre pizza today. It is easy to make your own vegan whole-foods plant-based no-oil pizza crust! I had no idea, I’ve been buying crusts forever, not really happy with them, but you know, we wanted to eat pizza! Now my family loves pizza even more! This vegan pizza dough barely needs kneading and it is no-rise dough. You can make a whole-foods plant-based pizza faster than calling for pizza delivery – and you know exactly what is in it. Recruit people to help you chop some beautiful toppings, and use your food processor for them, because that is the most time consuming part of making this. Pre-made crusts are full of oils and preservatives. You have to wonder what kind of crazy preservatives are in packaged crusts to keep them on the shelf for weeks without spoiling – that is not good for you! Any store crusts I can find have very little fibre, are made with refined grains, and are high in calories from fat and contain so many preservatives. This crust will not give you a stomach ache, it won’t bung you up, it contains no greasy fat, no preservatives. Here is some information I compiled about How to Judge the Healthiness of Grain Products. My daughter took some slices in her lunch and sent me this text about the pizza. We make vegan pizza from scratch every couple weeks now, because this dough is so scrumptious. Teenagers need pizza like this, and so do adults. I read somewhere that typical teenagers eat pizza so frequently they are getting like 25% of their calories from pizza now. That is BAD news for their insides and future health. use a rolling pin to roll out two large and thin crusts (which is a fun skill to learn). Put the pizza crusts on stoneware for best results. A pizza stone or rectangle stone work really well. Or use whatever baking sheet you have! Add lots of vegan toppings to the raw dough. Great healthy vegan pizza toppings start with oil free, 100% tomato sauce from a can, sprinkled generously with Italian seasoning. Add sliced Tofurky ham, or spicy vegan sausages (my favouite on pizza), diced spinach, frozen and food processed pinepple, yellow and green peppers, halved cherry tomatoes, and black olives. and you have two seriously awesome wholesome pizzas. and this pizza crust keeps really well in the fridge, it did NOT go soggy. Whoop! Here is how you can make it! This whole-foods plant-based pizza dough recipe uses prunes and no-oil. It comes together quickly, and bakes to a perfect crispness with a wonderful flavour. Use a rolling pin, and roll out thin and evenly, otherwise the crust will be too bready. Yield: Pizza dough for two large 14 inch (35.5 cm) diameter rounds, or two 11” x 14” (28 cm x 35.5 cm) baking sheet rectangles. Preheat oven to 500° F (260° Celsuis). Convection oven: use top and middle racks to bake 2 pizzas at once. Sprinkle cornmeal on a pizza stone/baking sheet or use a silicone mat or light cooking spray to prevent sticking. Blend the hot water, dates (or sugar), and prunes in a small high speed blender. Whisk the prune/date water, and quick rise yeast together in a liquid 2 cup measuring cup (so you can pour it into a running food processor later). If you use dates it will just barely fit in a 2 cup. With sugar about 1 2/3 cup. Allow yeast mix to grow and puff up for 5 minutes. Pulse flour, almond flour, nutritional yeast, garlic, and salt, in the food processor until combined. Slowly pour the yeast water mixture into the running food processor and run for about 2 minutes, until a shaggy ball forms. It should be sticky, but dry enough to pick up without it sticking all over your hands, add water or flour, if needed, to adjust (hopefully not). Flour on your work surface can make it less sticky too. Remove the pizza dough and separate into two equal balls. Place one dough ball at a time onto a heavily floured work surface and quickly knead a few times until it comes together. Use a rolling pin to roll the dough into a round about 14 inches in diameter, or a 11” x 14” (28 cm x 35.5 cm) rectangle/oval shape to fully fit your baking sheet. For best results, roll the dough out as thin and even as reasonably possible. Aim for 1/2 inch even thickness rather than a perfectly round shape. Spread it to the edges of your pans. Pinch dough under around the edges to make them thicker and give a grip to grab onto. Add sauce and toppings right up to the edges. Exposed crust will get very crispy. Use a generous amount of toppings! Our pizzas look like this before we put them in the oven. Bake 10 - 12 minutes, on the top racks until the exposed crust is a medium brown and is crispy. Watch closely and remove from the oven right away if you see or smell toppings or the crust burning. Customize your pizza for your family's preferences! Dates or applesauce might work instead of the prunes, but I bet they wouldn't be as good for creating a moist softness. The prunes are like magic. To save time, food process your toppings and spoon over! Tomato sauce, oil free from a can sprinkled with Italian seasonings. Blend fresh spinach into tomato sauce for extra nutrition and a rich dark colour. Peppered Tofurky sandwich slices, cut into triangles. We eat this pizza weekly lately, it's a real hit with the whole family. Nice rounded crust edge. Spicy vegan sausage. Simple. Rebecca prefers the slices with no olives. Sprinkled with nutritional yeast, if you like. The fast and easy no-rise inspiration comes from: Cookie and Kate. The prunes instead of oil inspiration comes from Youcef Banouni.